After knowing the HTC U12/U12 Plus playable formats, we can convert Blu-ray to these HTC MP4 or 3GP format with this Best Blu-ray Ripper which performs as an excellent Blu-ray to HTC Smartphone Converter. Follow the steps blow, you can easily rip Blu-ray to HTC U12 and HTC U12 Plus on Windows/Mac OS. How to rip Blu-ray to HTC U12/U12 Plus playback format on Windows? Download and install DVD Ripping software for Windows (10, 8, 7). 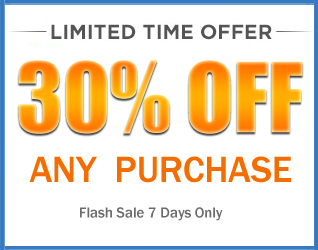 Then, just insert your favorite Blu-ray on the Blu-ray-ROM and load your Blu-ray files to this top Blu-ray ripping software through “Load Disc”. Alternatively, you can hit “Load Foder” to import files. In a minute, your Blu-ray files will be listed at the main panel. There you can learn your original video duration and trimmed video duration if you have trimmed your Blu-ray movies. Select “MP4” or “3GP” from the output formats list in “Foramt” drop-down list. You can get them under “Common Video” or “Android” category. Go to “Output” to set the output directory to save the converted files. You can also adjust other settings such as video quality, audio track, Bitrates, aspect ratio, brightness, contrast, saturation, etc. When the settings are done, click the “Convert” button to start conversion. And then the program will automatically start to convert Blu-ray to HTC “MP4” or “3GP” on Windows 10, 8, 7, etc. That’s all. When the conversion finished, you can click “Open” to locate the file in your hard drive. If you don’t want to wait around during the conversion, the smart Blu-ray to Android Converter can switch off the computer automatically when the conversion is done. Now, you can transfer the converted MP4 or 3GP video format to your HTC U12 or HTC U12 Plus, and enjoy watching Blu-rays on your HTC cell phones wherever you are. Insert the Blu-ray disc into your Mac and launch the Mac Blu-ray Ripper. Then click Load Disc to add the Blu-ray movies you want to play on your HTC U12/U12 Plus. You can load Blu-ray disc, Blu-ray ISO, Blu-ray folder, DVD disc, DVD ISO/IFO, DVD folder, any video format to this brst Blu-ray converting program. Choose HTC U12/U12 Plus supported video format. 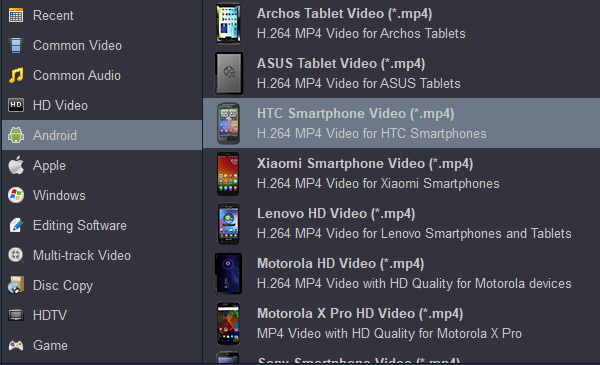 Video presets for all HTC models are provided. You just need to choose the model of your HTC smartphones. 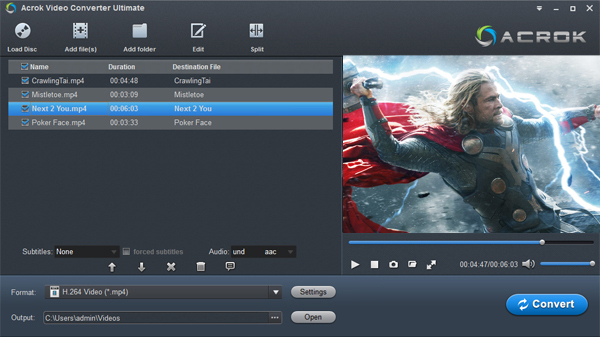 Tip: Customize the Blu-ray movies to fit better for your HTC mobiles. Besides streaming Blu-ray to HTC U12/U12 Plus, you can also touch up movies in Blu-ray to get a better playing experience on Smartphone with its built-in movie editor. Click “Convert” button to start Blu-ray to H.264 MP4 for playing on HTC U12 and HTC U12 Plus. Whrn the conversion is done, click “Open” to get the converted moveis, then transfer the movies to your HTC smartphone for playing on the go.